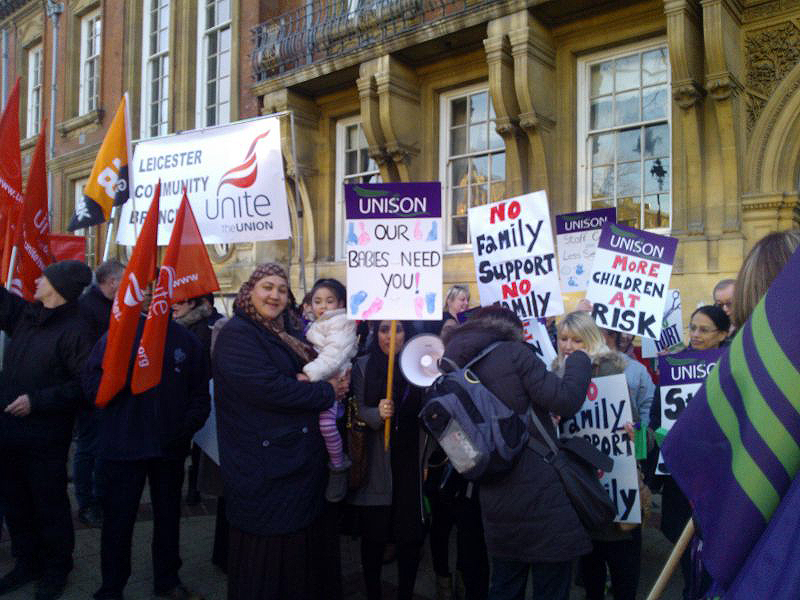 Around 200 people gathered to protest outside Leicester town hall where the council was holding it’s budget meeting at 4pm today. 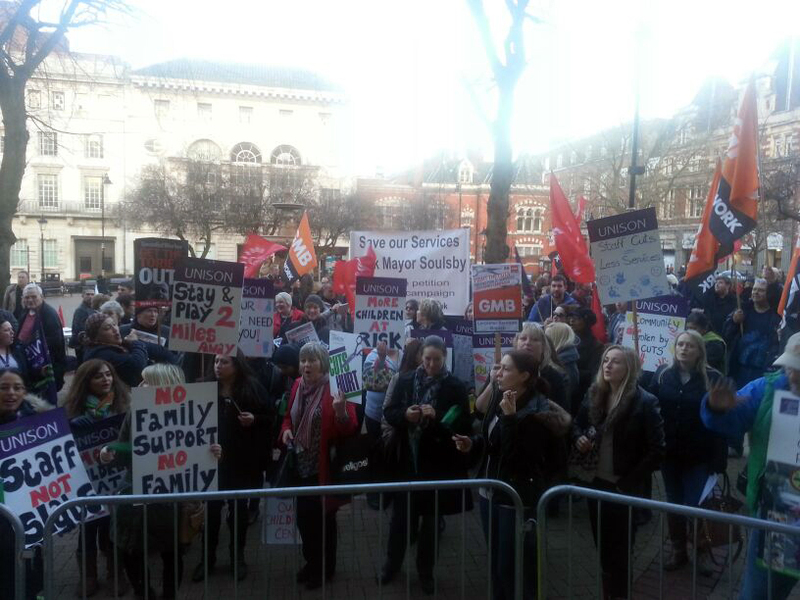 Unions were present along with members of community organisations and anti-cuts activists. Watch the videos here and here. The protesters were opposing the cuts to children’s services, the hated bedroom tax and the austerity measures being imposed by the Tories. 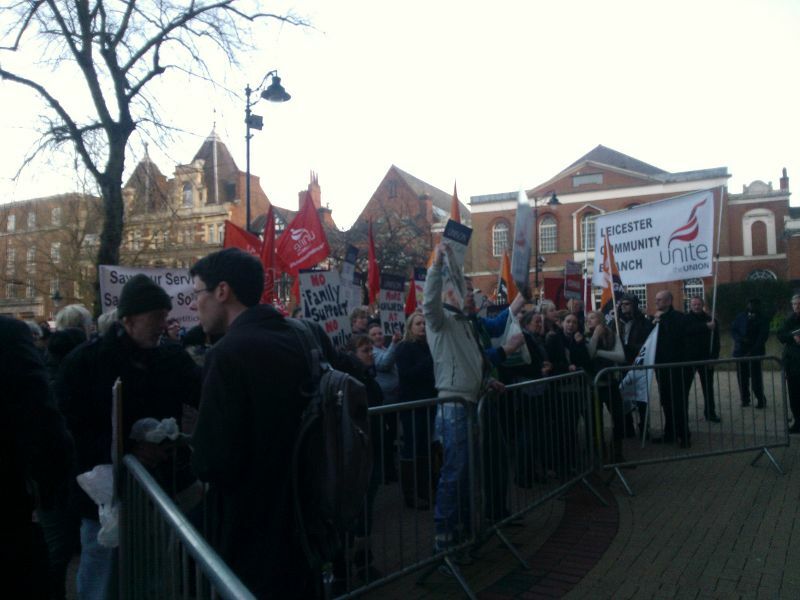 There was clear anger against the Labour council who are carrying through these cuts – demonstrators chanted ‘Labour council shame on you – shame on you for turning blue” and “They say cutback, we say strike!”. Speakers also called for a referendum on having an elected mayor. Many protestors had also come to show support for The Race Equality Centre and city adventure playgrounds which are also under threat. The government is carrying through it’s savage programme of cuts amidst a vicious campaign of scapegoating against immigrants – working class people cannot afford to let themselves be divided in this way. This is why the demonstration against racism and fascism on 22 March is so important. Leicester UAF is organising a coach to the demonstration which has already seen several local community groups pledge their support – book your place by emailing them. The rich are the ones who are really benefiting from the misery caused by low wages, poor housing and welfare cuts. However, workers have shown that where they fight back, they can win. One recent example of this are the strikers at Gateway college who won their dispute. Workers at Edinburgh College also scored a victory against bullying bosses. Also, the hated bedroom has been scrapped in Scotland because of a determined campaign against it. We should be taking inspiration from these victories and escalating the strikes and demonstrations – united we can win. 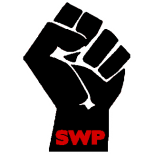 This entry was posted on Feb 26, 2014 by leicestersocialistworkersparty in Demonstration, Gateway College, GMB, Industrial Action, Labour Party, NUT, Unions, Unison, Unite.